This 2 page study guide explains the steps to form the present progressive tense. 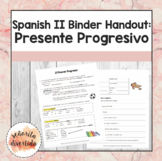 These are convenient reference sheets to help students study and form the present progressive tense. Las Tres Senoras hope that this study guide helps your students as much as it does ours. 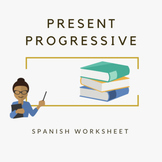 The Present Progressive Tense is a Power Point Presentation composed of conversations and paragraphs with questions and answers to be used in the classroom or as a homework. There is also a chart to explain how to use this tense with the corresponding subject pronouns. Print on cardstock and cut into cards; make 1 set for every 3-4 students. 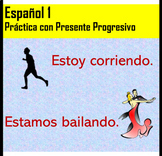 Includes 30 verbs in Spanish - regular and irregular. Pick and choose which ones to focus on. Vosotros included, but may be omitted if you choose. Use to play Concentration, Slap, Old Maid, Drats, Go Fish, Match Game. Guided notes to help teach the present progressive. Starts with an anticipation guide and moves to student production. Use the corresponding power point or smartboard to review the notes and include other activities. This quiz on the present progressive starts simple and becomes increasingly difficult with each section. It incorporates regular and irregular participles. Students will have to translate and create sentences. Included are three Spanish expressions that can be used as extra credit. 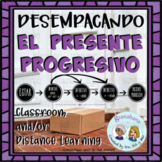 THese are the GUIDED NOTES for the Presente Progresivo (-ING) grammar rules. They have everything from regular endings to stem changers to help students have access to instant notes. 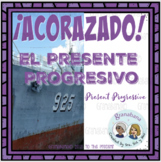 Use this worksheet to help students to master the present progressive. It starts with an explanation with examples of how to use it with "estar." The exercises progress from easier to more difficult. The worksheet has four sections with five sentences each:-Sentences with a subject, conjugation of "
DOMINO PRESENTE PROGRESIVO. ESTAR + GERUND. PRESENTE CONTINUO. GAME TO REVIEW THE PRESENT PROGRESSIVE. EVERY PIECE IS CONNECTED, IT CREATES A RECTANGULAR SHAPE. IT WORKS VERY WELL WITH PARTNERS. YOU WILL NEED TO PRINT AS MANY SETS AS YOU NEED FOR THE WHOLE CLASS. SOMETIMES I PRINT THEM IN DIFFERENT COLORS IN CASE THERE IS A MISSING PIECE ON THE FLOOR.